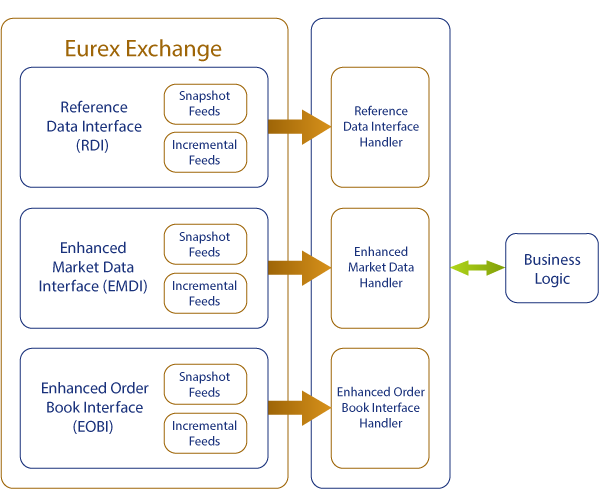 The OnixS directConnect: Eurex T7 Enhanced Market Data Interface [EMDI], Enhanced Order Book Interface [EOBI], and Reference Data Interface [RDI] Feed Handlers ultra-low latency solutions support the Eurex T7 Architecture with out-of-the-box direct market access to the Eurex derivatives exchange trading platform. Pre-tested – thus saving time and money in integration testing. Ultra low latency (single digit microseconds), high through-put, and low CPU load – designed for high-frequency and the fastest market data implementation. Book management, synchronization and recovery – more than just a market data decoder. Provides full book management with Order book depth (via EMDI) and individual orders (via EOBI). Individual subscription model allowing the selection of product groups – off loads the book management tasks to a specialized implementation. Trade volume reporting that includes reporting of single, double leg and strategy trades for on-exchange as well as OTC transactions. Includes fast-start source code reference implementations with client and latency benchmarking samples – designed for rapid familiarization and to get up and running quickly. provides access to un-netted price level aggregated market data. provides access to the entire order book without any depth limitation (e.g. side, price, priority timestamp and displayed quantity of each order and quote, trade price and traded quantity for each trade). provides access to reference data.